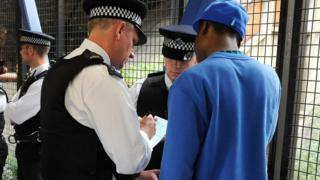 The data watchdog is investigating the Met Police’s gangs database following accusations it is “not fit for purpose”. A report by Amnesty International found the force’s Gang Violence Matrix was “racially discriminatory” and breaches human rights law. The database, set up in the wake of the 2011 London Riots, holds information on about 3,800 persons of interest. The Met Police said the matrix helped “prevent young lives being lost”. The report found the matrix tracked a disproportionate number of minorities, as well as 1,500 people who police had assessed as posing no danger of committing violence. The Information Commissioner’s Office (ICO) confirmed it was “in contact with the Metropolitan Police Service as part of an investigation into their use of a gangs database”. Figures from July 2016 showed 78% of the people listed were black. Police figures show 27% of those prosecuted for youth violence are black. About 13% of London’s population is black. The matrix uses various intelligence including history of violent crime, entries on social media and information from bodies including local councils to identify gang members. They are then given a score assessing the risk they posed. Around 40% of those on the list have a “harm score” of zero, the report found. Those with a zero score may be in custody and therefore not currently offending. Being on the matrix could affect access to housing, education and job centre services, the report claimed. The charity’s UK director, Kate Allen, said: “There is clearly a huge problem with knife crime violence at the moment in London, but the gangs matrix is not the answer. “The entire system is racially discriminatory, stigmatising young black men for the type of music they listen to or their social media behaviour, and perpetuating racial bias with potential impacts in all sorts of areas of their lives. Individuals identified on the matrix are offered support to divert them away from both offending and becoming a victim of violence, Scotland Yard said. The Met said it was working with Tottenham MP David Lammy, Amnesty International and the ICO to “help understand the approach taken”. It is understood that officers in Nottingham, Manchester and Birmingham gather similar information on gang links.